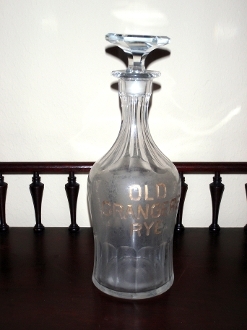 Old Granger Rye back bar bottle decanter with gold embossing. Nice cut flutting on neck & base. Inside bottle is cloudy with some residue present. Bottle stands 8 5/8" alone and with stopper 9 5/8". Nice shapely bottle.